Not having read the first two of this series, I was pleased to see that I had no trouble diving right into the Men of Valor world. While it eventually became apparent that knowing the stories of Finn’s brothers would be fun, it was not essential to understanding or enjoying Finn’s story. Rather, I was able to learn everything I needed to know with and ease and a natural flow. I enjoyed spending some time with both Finn and Dana, learning a bit about who they are and how they tick, all amid the unknowns of a dangerous game being played out just outside their doors. Both characters are likable, flawed, sympathetic, wounded and enjoyable. If they were real people, I would like to be their friends. That said, the novel seemed to skim over the true depths of hurt that both of these characters were experiencing. While their traumas seemed to play out mostly in whether or not they experience nightmares on a regular basis, I think their pain and the way it played out in their lives would be incredibly more nuanced and complex. In fact, were these people my friends, I would hesitate to encourage such a thing as romance until much more healing work was done. These thoughts, however, might stem from my own family’s relatively recent trauma. As a reader, I probably wouldn’t have thought twice about this a few years ago. The setting plays such an important role in the plot that I was glad to see it developed almost into a character itself. The small town, the wooded countryside, the lake that everything revolves around — it sounds like somewhere I would enjoy experiencing myself. 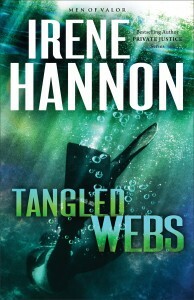 I would have liked to have gotten to know more of the local color, but the book only spans a few weeks of time, so Hannon’s use of only a few townspeople can be forgiven. Plotwise, this was a fun escape. It wasn’t terribly suspenseful, as the reader gets a good look at the situation from the perspective of those behind the menacing pranks, it doesn’t come as a surprise when Finn and Dana begin making discoveries. But by allowing the reader a peak into that side of the story, Hannon cultivates a certain amount of sympathy for the antagonists. Even without the suspense though, Hannon kept me reading diligently to the very end. It may not be genius, but it is solidly written throughout. I would recommend this book for fans of contemporary inspirational fiction for a fun escape into an interesting world of likable characters. I received a complimentary copy of Tangled Webs from Revell Books, but I was not otherwise compensated for this review. All writing, thoughts, and opinions are solely mine.